Champion mare Winx will hit the track again this afternoon, aiming to take her winning streak to an astonishing 31 in the $600,000 Chipping Norton Stakes (1600m) at Royal Randwick. Should she cross first, she will also claim a world record 23 consecutive wins at Group 1 level. Odds are at a slim $1.10 for the seven-year-old to claim victory in today's race, which begins at roughly 3.40pm in Sydney. "She could (lead) but she never has before,'' jockey Hugh Bowman said in the build-up. Winx snagged another record in February, winning the Apollo Stakes for the third time but she has also become the first Australian horse to post 30 consecutive wins. Winx was at $1.10 to win the race, ahead of second favourite Happy Clapper, who jumped at $11.10. But the result was never in doubt with Winx, who sat back before unleashing her trademark finish over the top of Happy Clapper, claiming a race record to boot. Legendary sportscaster Bruce McAvaney said "it's a national event every time she races" with a huge crowd turning out at Randwick to see the champion mare race. "She's a once in a lifetime horse, she's a once in a two centuries of Australian racing horse, I've never seen anything like it," McAvaney said. 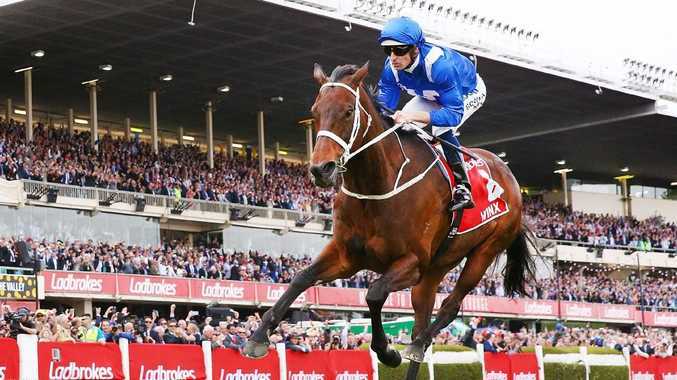 "It's quite unbelievable, it's racing of years gone by, we got a glimpse of it with Black Caviar of course, your Makybe Diva's and now Winx following on from that, it's indescribable for any sport and for racing and it's exactly what we need." Puerto Rico's Camarero holds the world record of 56 wins in a row before he lost, followed by Hungarian mare Kincsem with an undefeated record in 54 starts, before Puerto Rican horses Cofresi (49 wins), Condado (44) and Galgo Jnr (39) ahead of Winx. Jockey Hugh Bowman said she has "nothing to prove". Speaking on SEN, he said she may still be around in spring and could even chase a fifth Cox Plate, which could get her closer to the top five consecutive wins.